Urim, the name of the ancient city of Ur, is a new civil society undertaking by Iraqi and Italian archaeologists, architects and activists. The Urim Initiative will advocate with Iraqi authorities to implement a preservation plan for Ur, that protects its archaeological treasures through sustainable development carried out in partnership with residents from the surrounding area. A preservation and protection plan will be developed by experts in Iraqi heritage and archaeology at the Sapienza University in Rome and the firm of the Italian architect Carlo Leopardi. The Urim Initiative will cover all the costs related to developing the plan, which will then be submitted to the relevant Iraqi authorities for their review and approval. Once a plan is approved, the Urim Initiative will undertake fundraising to finance the implementation of the plan on the ground, with the continued assistance of the Italian experts. In this way, the Urim Initiative aims to assist the Iraqi authorities in fulfilling the requirements of the UNESCO declaration of the site of Ur as part of the “Ahwar of Southern Iraq: Refuge of Biodiversity and Relict Landscape of the Mesopotamian Cities”. The Ahwar encompasses a large area of great natural and cultural heritage including four distinct, geographical areas: 1) the Central Marshes in Maysan and Dhi Qar, 2) Huweiza in Maysan, 3) East Hammar in Basrah, and 4) West Hammar in Dhi Qar. The archaeological sites of 1) Ur, 2) Uruk and 3) Eridu are all within the Ahwar. 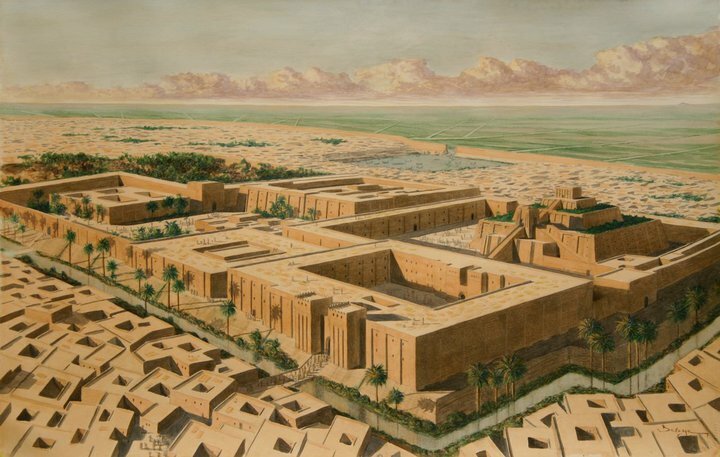 The Urim Initiative advocates for the sustainable development of one of these sites, the ancient city of Ur, and proposes to involve local civil society in Nasiriyah in dialogue on the development and implementation of a management plan. The initiative will assist in creating interpretive signs and exhibits at the site that will explain the importance of the site and its protection. UNESCO’s decision 40 COM 8B.16 which inscribed the Ahwar on the World Heritage Site List specifies a number of requirements for the archaeological sites and obligates the Iraqi Government to implement these requirements with the support of UNESCO’s advisory bodies IUCN, ICOMOS, and the World Heritage Centre. Foremost among these requirements is to “produce a detailed master plan/road map that ensures the conservation of the property on a sustainable basis”. This is the aim of the Urim Initiative for the archaeological site of Ur. Members of the Urim Initiative will visit Nasiriyah to discuss its proposal with the Department of Antiquities, local Iraqi experts on Ur, and residents of the community during the Ahwar Festival, which is being organized by the Humat Dijlah Association, the Mashufna Cultural Center, and other Iraqi civil society organizations, from 19-21 June, in the Marshlands of Chibayish. A seminar entitled “Protecting the Archaeological Site of Ur” will be held on the morning of 20 June, in the Provincial Council of Nasiriyah during which experts in sustainable management of archaeological sites will discuss the proposal of Urim Initiative. The Urim Initiative will send a delegation to attend the 42nd session of UNESCO’s World Heritage Committee, which is scheduled to be held in Manama, Bahrain, from 24 June to 4 July, and is expected to discuss the development of the Ahwar and other Iraqi sites. Italian architect Carlo Leopardi, an expert in Iraqi archaeological sites, including decades of work at Ur. The Urim Initiative is a non-profit undertaking of Iraqi and Italian parties. It is funded by its members with the support of the Fondation Assitance Internationale.